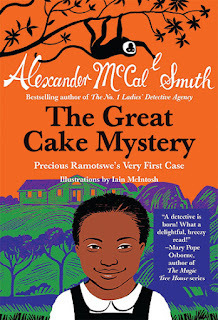 Precious Ramotswe must ranks up there with some of the best-loved fictional detectives of all time, rubbing elbows with Hercules Poirot, Cadfael, and Father Brown. But as beloved as she is among adults, did you know that the star of Alexander McCall Smith's The No. 1 Ladies Detective Agency is also popular among children? 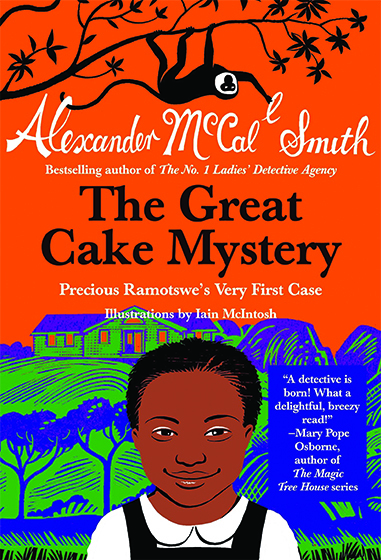 McCall Smith has written a series of mysteries for children, featuring Precious when she was just eight years old. For those who don't already know, Precious lives in Botswana. In The Great Cake Mystery Precious doesn't think of herself as a detective yet, but her dad thinks she has it in her. So when a classmate is accused - without any proof – of eating someone else's sandwich, she is upset. Precious, you see, is a kind girl who wants to help others. In this case helping means setting a trap to catch the real snack stealer. SPOILER ALERT: Precious bakes a cake full of glue, covers the whole thing with icing, and places the cake outside the classroom "on the shelf where the children left their bags." And not too long afterwards the whole class hears the howling cries of the little thieves - monkeys! Precious has saved her friend from the mean accusations of their classmates. And, this being a old-fashioned sort of book, those classmates are truly sorry for what they thought and said. We've read two other "young Precious" mysteries so far, and our daughters have loved both The Mystery of Meerkat Hill and The Mystery of the Missing Lion. I had a slightly different take. While I loved the former, I thought the later was marred by a insertion at the end where they treat a lion as if he were a person. Precious ends up giving a brief lecture about how all lions should live free, including the missing tame lion they'd just recovered, and all the adults side with the child. It is, on the one hand, no big deal - it is only a few pages in an otherwise enjoyable story. But it rankled me because this childish "feel-good-ism" is rampant in our culture, and I don't think we need to be feeding any of it to our undiscerning children. The fact is, a tame lion would most likely die in the wild and a well-treated tame lion is not an oppressed lion. So what Precious proposes is both completely unnecessary, and quite likely very harmful to the very lion she wants to help. We're taught that good intentions are what really matters, but God says otherwise (Prov. 27:14) – if our well-meaning efforts cause damage, then we need to stop doing this well-meant damage! My wife and I didn't know about this brief lecture until we came across it in the audiobook with the kids listening along. It wasn't objectionable enough to stop listening to the book we were already three-quarters of the way through, but if I was buying this series for a Christian school library I would get The Great Cake Mystery and The Mystery of Meerkat Hill, but give The Mystery of the Missing Lion a pass. There are two others in the series but we have yet to read (or listen to) them. I should note that the audiobook version are truly remarkable, with the reader delivering all sorts of wonderful accented voices. Oh, and if your kids like this series, they might also enjoy a five-book series McCall Smith wrote about Akimbo, a boy who lives on a game reserve in Africa. I've reviewed those here. All, in all, these are books that children even as young as 5 may really enjoy listening to, and 9 year-olds and up could really enjoy reading. Our whole family was thoroughly charmed.